Benjy Beagle is a handsome elder statesman originally from West Virginia, where he spent his life in a hunting pack. No one has to guess at this, although he came through the shelter system without identifying details–his freeze brands tell that tale. This is not an “ohhh, poor dog!” moment. Benjy has been a working dog, doing what this breed was developed to do. He’s made it to a grand age, so however he ended up in the shelter system, he lived well enough along the way (if you don’t count tooth care, ugh). He’s profoundly socialized–the perfect Omega, as one would expect from a working pack dog. If he scolds another dog, it’s done appropriately. If he’s concerned about another dog, he handles the situation quietly, making himself invisible. He loves people, loves a good cuddle (loves a good SNACK!). I’ve been watching him on day care web cam for a while now. Heh. Benjamin Beagle is a very, very cool dog. 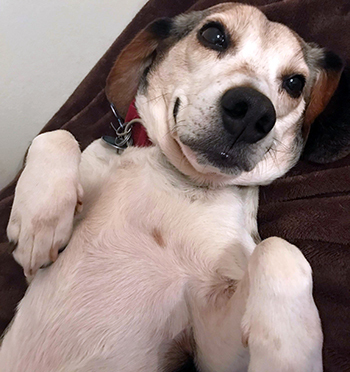 He’s also a very lucky dog, because when his compassionate adopter lifted him from the shelter system and made a home for him, she also quickly recognized that his adjustment issues were about more than just the change of pace. They were about pack–missing pack, needing pack. 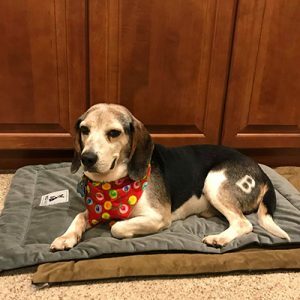 And then he’s lucky again, because his adopter had a high-end Beagle breeder in the extended family, and boy do breeders dive in when it comes to taking care of their breeds–not just preserving them, but pitching in to support the lost and unhomed, whatever their origins. So from his adopter, doing everything possible for her newly adopted dog, to the breeder–spreading the word far and wide that Benji needed himself a pack–to us. We’re actually full up. We have four dogs and we’re starting to think about a puppy. BUT. I’ve always wanted to give an older dog a retirement home. We’ve just been waiting for the right dog. This dog. Benjy is between Dart and Connery in age. With his Omega nature, he should get along very well with Connery; he should get along very well with Tristan. He’s likely to adore Alice, as they all do. And he’s likely to give Dart the space that Dart needs. Benjy should be happy here and we’ll be happy to have him. Because, er…he is in fact here. After two months of quietly waiting for the logistics to come together, on Friday, Benjy flew in from the DC area to become part of our family. Our pack! And if it feels a little bit crazy, it also feels right.